Portugal are held to a goalless draw in their opening Euro 2020 qualifier against Ukraine as Cristiano Ronaldo returns to the side. Argentina's Lionel Messi and Portugal's Cristiano Ronaldo are set to play for their countries for the first time since the World Cup. 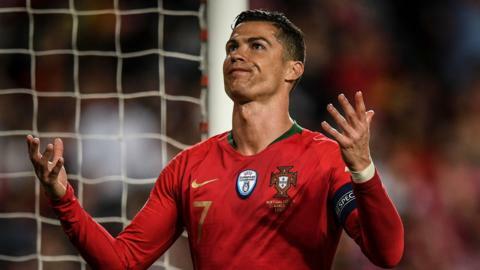 Portugal will remain formidable opponents in Tuesday's Hampden friendly against Scotland despite the absence of Ronaldo, Pepe and Bernardo Silva. Injury may have denied Ronaldo a full part in the Euro 2016 final against France, but Portugal's win completes his set of honours. Bale v Ronaldo: Who has the edge? As Gareth Bale and Cristiano Ronaldo go head to head at Euro 2016, BBC Sport compares their tournament and careers to date. Read more on Bale v Ronaldo: Who has the edge? Cristiano Ronaldo may be one of the world's greatest players but he is enduring a frustrating Euro 2016 so far.